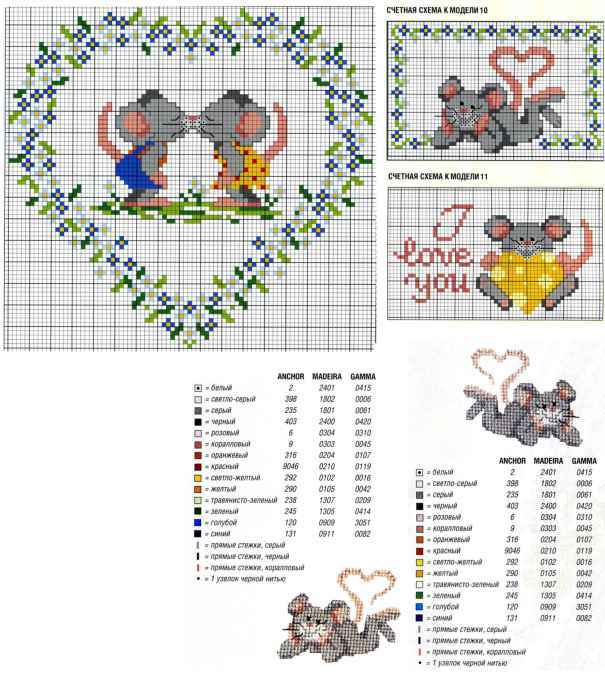 You'll need: 2 cards with a Mat; canvas Aida; embroidery floss; embroidery needle. Execution of work: for each postcard, canvas Aida to carve out a rectangle 15 x 10.5 cm. Embroidery floss in 3 addition, straight stitches and knots - 1 strand. Motifs to embroider on the counting schemes 1 and 2. 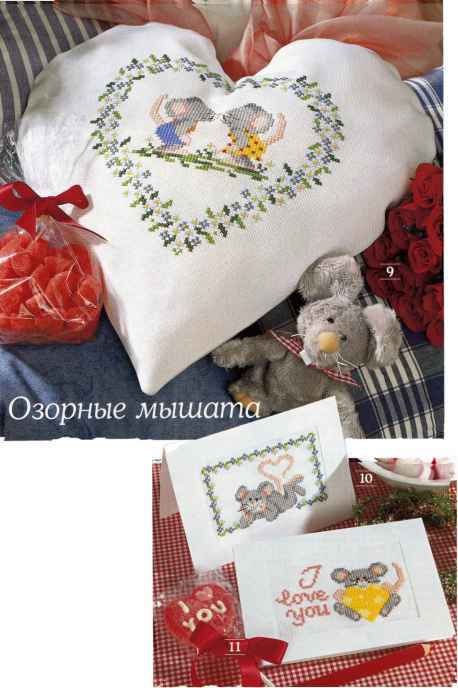 Embroidery steam iron on the reverse side and glue them to the card. You will need: to case 50 x 140 cm white fabric for embroidery countable (80 threads/10 cm); floss; cushion 50 x 115 cm white cotton fabric; zipper length 25 cm; embroidery needle; polyester. Execution of work: to cover to And find details With seam 1 cm wide For a pillow to cut out 2 parts And the seam 1 cm Embroidery thread in 3 addition, capturing 2x2 thread fabric, straight stitches and knots - 1 strand. Motif to embroider on the counting scheme in the middle of the front of the case. Open sections of all the details to process zigzag stitching. Details of the back side of the cover stitch on straight sections, with average of 25 cm to be left open for zipper. To vacate zipper. The details of the case folded right sides and sew. Remove the product on the front side. The details of the pillow folded, right sides and sew, with a small section of the seam is left open. Remove the product on the front side, to fill with batting and sew the hole.